When BTwin released its new range of Triban bikes last year, Dave Arthur commented that the 540 'looks like a great bike on paper'. I'm happy to report that it lives up to expectations – it's a real joy to ride, with an incredible spec at a low price point that had me double-checking BTwin had got it right. The triple-butted aluminium frame feels fast, comfortable and responsive, without much of the buzzy feeling you sometimes get from aluminium. The carbon fork also effectively absorbs bumps in the road. There's little to complain about, comfort-wise. It has front and rear rack and mudguard mounts, so you can load it up for weekend tours or all-year-round commuting. The Triban 540 is a pleasure to pilot, whether you're on smooth new tarmac, decaying and rough road surfaces or, to my surprise, over some particularly toothy London cobbles. But this makes sense when you check the seat tube – proudly proclaiming that the bike was designed in Lille and tested on the (relatively close) roads and cobbles of Flanders. It shows. BTwin hasn't gone down the route of oversizing the bottom bracket junction, keeping with a standard sized press-fit unit, but the frame doesn't seem to lack anything because of it. This equates to a tiny bit of flex in the bottom bracket at full acceleration, but not something you'd notice unless you were trying hard to. BTwin has oversized the front end, though, using a tapered head tube – 1 1/8in at the top flaring to 1 1/4in at the bottom. It's all about adding stiffness by increasing the cross sectional area; firstly it gives you a larger weld area so you can increase the diameter of the down tube, plus the alloy steerer of the fork is bigger, with all of these tweaks allowing for better steering accuracy and resistance to braking loads. Thanks to these design features, the bike is stiff enough to react well to bursts of power, while out of the saddle it's easy to get into a rhythm to climb, or accelerate out of a corner. It's so comfortable, and fun, rides felt shorter than they actually were. The slim seatstays offer some flex, and while steering feels easy and relaxed when you're cruising, it's responsive when you need it to be. Decathlon's own-brand dual-pivot rim brakes performed well, including for sudden stops – no complaints there. Although the 540 is marketed as '105' (as in the Shimano groupset), BTwin has reduced costs by putting a Tiagra 12-28 cassette and Prowheel Ounce 721 compact 50/34 chainset on the frame; gear changing was easy, if not totally effortless. The ergo handlebar is essentially a shallow drop bar, the width being specific to each of the five frame sizes within the range. I tested the 52cm, and getting into and holding a variety of riding positions was easy. Importantly, for a person with small hands, the brake levers were easy to reach. The 52cm size is the smallest in the range, which sadly rules it out as an option for smaller riders. The alloy handlebar, stem and seatpost are all solid choices for the price. The bike is unisex, but Decathlon provided a women-specific saddle for testing – a choice it offers to all customers. It proved comfortable even on long rides, though of course saddle choice is very much a matter of personal preference. The 24mm-deep Mavic Aksium One wheels, with 20 front and 20 rear spokes, never felt like they were compromising the ride. The 25mm Hutchinson Equinox tyres roll well and offer decent amounts of grip, and are good enough to use until they wear out, as opposed to replacing early. When they do wear out, the frame has enough clearance for 32mm tyres (without mudguards) – which would increase comfort further. Looks-wise, the 540's muted black and gunmetal greys are offset by BTwin's half-and-half coloured bar tape, in this case, half black, half lumo orange. The matching highlights on the frame are a nice touch. The welds aren't the smoothest, but that's hardly cause for complaint at this price. Overall, this bike is a great buy for those new to road bikes and those looking to their next cycling challenge. And Decathlon offers a lifetime warranty on the frame, fork, stem and handlebar. New Triban frame with carbon forks, Shimano 105 groupset and Mavic Aksium ONE wheels. The frame accepts up to 32mm profile tyres and full mudguards, as well as a front pannier. New B'Twin Sport sloped frame made of 6061 T6 aluminium headtube for an integrated headset. Short frame geometry. Weight: 1900 g in size 57. Strong, versatile frame: mudguard and front and rear pannier racks can be mounted. This fork combines strength, low weight, and precision. Shimano 105 shifters: the market benchmark.Weight: 485 g.
Shimano 105 double front derailleur. Shimano 105 10-speed rear derailleur. SHIMANO TIAGRA 10-speed 12/28 (12/13/14/15/17/19/21/23/25/28) cassette. PROWHEEL OUNCE 721 compact, 50 x 34 chainset. XS, S: 170 mm / M: 172.5 mm / L, XL: 175 mm. B'TWIN long dual-pivot callipers: reliability and power; a mudguard with stays can be fitted. New, ergonomic B'TWIN SPORT handlebars for better grip and excellent comfort. Handlebar width end to end: XXXS, XXS: 380 mm / XS, S: 400 mm / M, L: 420 mm / XL, XXL: 440 mm. Height 24 mm for increased lateral rigidity. Steel spokes (20 front and 20 rear). Hutchinson Equinox 700x25 folding bead tyres for higher performance and greater comfort. New B'TWIN ERGO FIT saddle. VP 383 pedals with toe clips. 9.5 kg in size M, without pedals. Comes with front and rear-lighting kit and bell. B'Twin calls this "the ultimate commuter and sportive bike". It says: "With new ergo bars and saddle and a frame which accepts up to 32mm profile tyres and full mudguards, rider comfort is not forgotten." It is well suited to commuting and sportives. Frame is comfortable; welds are a little knobbly-looking but the ride is great. 6061 aluminium frame, carbon fork. BTwin's Sport sloped frame with short frame geometry. Fine – no complaints; stack height and reach (the vertical and horizontal measurements from the centre of the bottom bracket to the top of the head tube) were good for the stated size. Yes, very comfortable. The bike coped well with even very rough road surfaces – the ride still felt smooth. Stiffness and flexibility were well balanced. Well – there was no feeling of loss of power. The 24mm deep Mavic Aksium ONE wheels, with 20 front and 20 rear spokes, never felt like they were compromising the ride. The wheels are high spec for the price. No need to change the wheels. The Hutchinson Equinox tyres rolled well and offered decent amounts of grip; good enough to use until they wear out, no need to replace early. The BTwin Triban 540 is a great road bike at an incredible price, with components you'd normally find on much pricier models. The ride is comfortable, efficient and responsive; good enough for rough commuting, weekend club runs and sportives. And it's currently reduced to £450. Nice review - looks like a screw-in Hollowtech type Botton Bracket through, going by the photo, not a press-fit. (They review says its press fit) Which is no bad thing, as Hollowtech BBs are ace, and easily user-servicable at home, and Ultegra ones only cost about £12. (which is why loads of frame builders like Mason stick with it) Bargain. Those welds. You could use your new decathlon bike as a cheese grater. Great bike and very anti-snob too. Plus threaded BB. Great. Bargin I'd like to have seen 105 series brakes though and think they'd be worth paying an extra £20 for. Make a perfect winter bike on a budget. Was their welder on strike and they got the trainee in! Ali can be difficult but blimey stevey wonder would have done a better job. Edit: take it back about the brakes they are long drops for guard clearance. 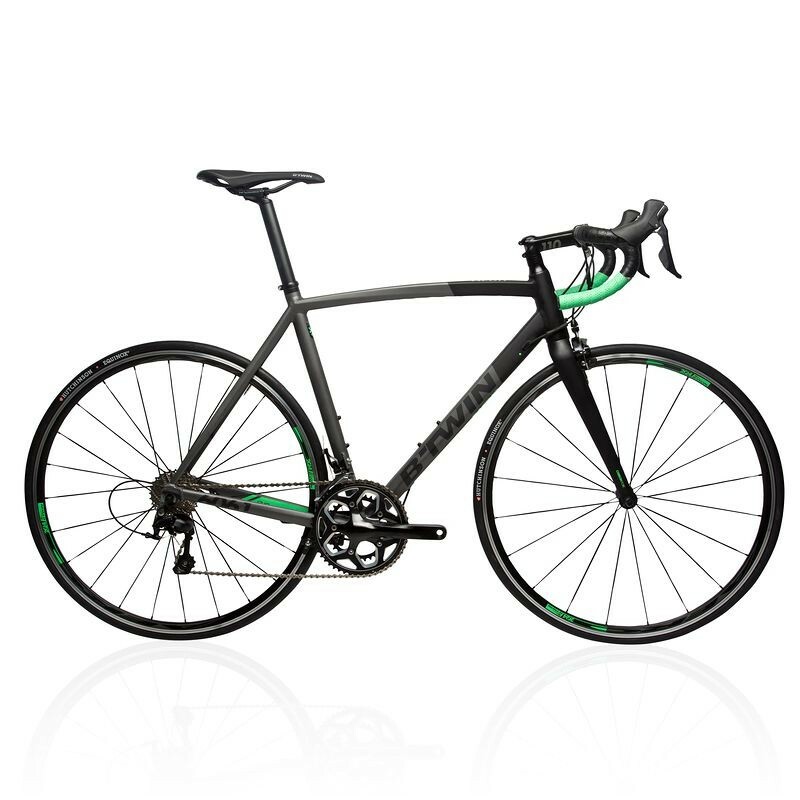 They're currently selling the Triban 3 (in smaller sizes) for £150. Carbon fork, 9-speed Shimano triple, 650c wheels. Pretty much the bike that started the whole Triban thing in this country. Good option as a starter road bike if you fit it, frame is good and upgradeable. The bike is unisex, but Decathlon provided a women-specific saddle for testing – a choice it offers to all customers. Is there an official source for this? My girlfriend bought the older 10 speed b'twin 540 from Oxford Decathlon the other day and asked about this, but no one in the store (including the manager) had heard of this policy. This is now selling at £650 but is sporting a upgrade to the RS500 non-series Shimano cransket and 11-speed. Slightly surprised its a 52/36 rather than a compact; I wonder how many riders at this price point would exploit a 52/11 or cope with a 36/28 combo.